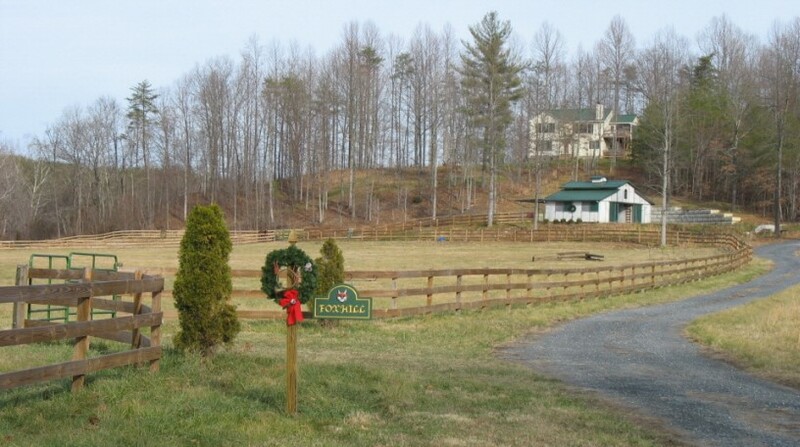 Sometimes when we hunt Foxden, Sara will offer to let us park at her huntbox, Foxhill Farm. Please only park here when it is announced that we are doing so. I-64 West to Exit 107 – CROZET (next exit after the Interstate Rest Area). Left onto Route 250 West. Go app.5 miles to the intersection of Route 151, located at foot of AftonMountain. Follow sign for Wintergreen Ski Resort. Left onto Route 151, CRITZERS SHOP ROAD, go app. 7.8 miles to Ashley’s Store, Liberty Gas Station, on right side with several “No Parking” signs along store area. SLOW DOWN. In approximately 100 yds, turn left onto Route 635, GREENFIELD ROAD. Left onto Route 635. Go app. 2 miles to Route 611, ENNIS MOUNTAIN RD. Left onto Route 611. Go app 300 yards downhill …drive slowly. At bottom of hill take the second gravel entrance on right. Immediately fork left at 3 board horse fencing. House is a yellow two story with green tin roof and is located on knoll above barn. Travel time from I-64 Exit 107-Crozet to Foxhill Farm is app.20 mins. From I-81 take I-64 East to Exit 99, AFTON, at the top of Afton Mtn. Turn Right off exit ramp onto Rte 250 East. Descend AftonMountain, at the bottom, turn right onto Rte 151 CRITZERS SHOP ROAD. Follow same direction above as if coming From the East. Take Rte 29 South to Rte 6 West, ca. 30 mins south of Charlottesville. Turn Right onto Rte 6 –just past bridge at a small garden center.. Continue to the T- intersection of Rte 151. Turn right onto Rte 635-GREENFIELD RD. Go app. 2 mi to Rte 611-Ennis Mtn Rd on left.. Turn left onto Rte 611, go app 300 yards down the road…drive slowly. At bottom of hill take the second gravel entrance on right. Immediately fork to left at 3 board horse fencing. House is two stories with green tin roof and is located on knoll above the barn. Turn left onto Rte 6 West.